Our original version of the details of men commemorated on the 1914 - 1918 Kingsteignton War Memorial first appeared in 2005. We are very pleased to be able to include this update contributed by Richard Harris who has not only extensively researched this material but has revised and, where necessary, corrected our original version. Kingsteignton's War Memorial is situated in a small burial ground extension across the lane from St. Michael's Churchyard. It consists of a base, plinth, pillar and Maltese cross all in granite and was designed by Canon Mills of Truro. Three faces of the plinth have decorative slate panels - the largest carries the names of the dead of World War 1 while the names from World War 2 are split between the two smaller panels. There is a close-up of the World War 1 panel at the foot of this list. 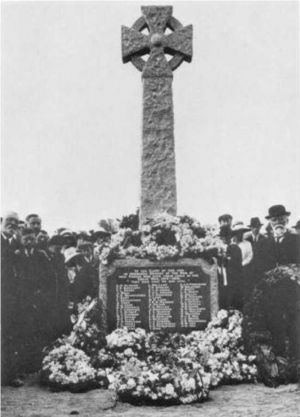 The memorial was unveiled on May 24 1921. Corporal George Henry Almond of 1102nd H.T.Coy, the Royal Army Service Corps. Son of Thomas and Sophia Almond and husband of Elizabeth Almond of 2 Berry Cottages. Kingsteignton. Born in 1872. Died 1 September 1919 during the Archangel Campaign aged 47. Also served in the South African Campaign. Stoker 1st Class Frederick Richard Bartlett of the Royal Navy, HMS Indefatigable. Son of Thomas and Mary Bartlett of 17 York Terrace, Kingsteignton. Born in the March Quarter of 1894. Died 31 May 1916 at the Battle of Jutland aged 22. Private Frank Lewis Bovey of the 31st Vet. Hospital, the Royal Army Veterinary Corps. Son of William and Selina Bovey of Kingsteignton. Born in the September Quarter of 1894. Died 21 August 1918 aged 24. Private James Bray of the 2nd Battalion, the Devonshire Regiment. Son of James and Agnes Bray, of 2, Woolaton Terrace, Kingsteignton. Born in the June Quarter of 1890. Died 7 February 1915 aged 25. Petty Officer George Henry Brimecombe of the Royal Navy, HMS Opossum. Son of Richard and Mary Brimecombe of Kingsteignton. Born in Kingsteignton in the March Quarter of 1892. Date of death not yet known - HMS Opossum was a protection vessel with a crew of 50 which survived the Great War. Sergeant Frank Burt of the 13th Quebec Regiment, the Canadian Infantry. (Previously served in the Royal Sussex Regiment for 10 years). Born in Brighton, Sussex, 26 May 1876. Husband of Mary Jane Burt (née Joslin) of 1 Victoria Terrace, Kingsteignton. Died 24 September 1916 aged 40. Believed to be 84030 Gunner Frank Cockerham of the Royal Field Artillery. He is mentioned in an account of the death of his older brother John which appeared in the Mid Devon Advertiser in 1917. In this, it was stated that he had died in France in 1916. His birth in Kingsteignton was registered in the December Quarter of 1891. Private John William Cockerham of the 10th Battalion, the Devonshire Regiment. Son of John William and Charlotte Cockerham of Kingsteignton and husband of Emma Cockerham of Newton Abbot. Born in 1890. Died 27 April 1917 aged 27. Second Lieutenant Henry James Cook of the 8th Battalion, the King's Own Yorkshire Light Infantry. Son of William and Eliza Cook of Blindwell Farm, Kingsteignton. Born in the June Quarter of 1889. Died of wounds 6 October 1915 aged 26. Bombardier Harold William Cornall of the 90th Brigade, the Royal Field Artillery. Son of William and Elizabeth Cornall of Kingsteignton and husband of Hilda Kate (née Potter). Born in the September Quarter of 1890. Died 20 August 1916 aged 26. Buried in St. Michael's Churchyard, Kingsteignton. Driver Frederick Thomas Courtier of the 16th Battery, the Canadian Field Artillery. Husband of Edith O. Courtier of Fore St. Kingsteignton. Born in the March Quarter of 1895. Died 4 September 1918 aged 23. He was a Canadian citizen. Able Seaman Frederick George Dennis of the Royal Australian Navy on attachment to the Royal Navy. Husband of Florence Dennis of Fore Street, Kingsteignton. Born in the September Quarter of 1885. Died 14 September 1914 aged 28. He was an Australian citizen. Stoker 1st Class George John Diamond of the Royal Navy, HMS Goliath. Son of George and Catherine Diamond of Ideford and husband of May Diamond (née Cleave) of Sand Path, Kingsteignton. Born in the March Quarter of 1880. Died 13 May 1915 during action in the Dardanelles aged 35. Driver William James Dobb(s)* of the 13th Brigade, the Royal Field Artillery. Son of John and Elizabeth Dobb of Gestridge Rd., Kingsteignton. Born in Kingsteignton in the September Quarter of 1897. Died 22 May 1916 aged 18. *Documentation relating to this family always gives "Dobb" as the family name. Private William Ellis of the 2nd Battalion, the Devonshire Regiment. Died 10 May 1915. We know he was born in Kingsteignton (see Soldiers Died Vol. 16) but cannot yet complete the link to his family. 41136 Pioneer Joseph Harold Farleigh of the 90th Field Company, the Royal Engineers. Son of William and Mary Farleigh. Born in Kingsteignton in the June Quarter of 1891 but the family later moved to Ideford. Killed in action 2 February 1916 aged 24. Buried at Tancrez Farm Cemetery. Believed to be George Ford. A soldier of this name is mentioned in a Mid Devon Advertiser of May 1915. The Commonwealth War Graves Commission listing includes a Private George Ford of the Devonshire Regiment who died 25th April 1915. 15826 Private William Leslie Harding of the 8th Battalion, the Somerset Light Infantry.Son of the late William and Mignonette ("Minnie") Harding (née Hurford) of the Post Office, Fore Street, Kingsteignton. Born in South Petherton, Somerset in the June Quarter of 1898. Died 1 August 1917 aged 19. Petty Officer Stoker Thomas Alfred Heyward of the Royal Navy, HMS E30. Son of John and Bessie Heyward of Greenhill Lodge, Kingsteignton and husband of Lucy Heyward of Laira. Born in Ludlow, Salop in the June Quarter of 1879. Died 22 November 1916 aged 36. Holder of Long Service and Good Conduct Medals. Able Seaman Leonard Newton Holland of the Royal Navy, HMS Indefatigable. Son of James and Mary Holland of "Woodside" Church Street Kingsteignton. Born in the March Quarter of 1895. Died 31 May 1916 at the Battle of Jutland aged 21. Gunner Thomas Henry Howard of the 312th brigade. the Royal Field Artillery. Son of Thomas and Sarah Jane Howard of 13 Woolaton Terrace. Born in the December Quarter of 1894. Died 9 March 1917 aged 22. Second Lieutenant Evelyn Llewellyn Hustler Jones of the 1st/2nd Battalion, attached to the 1st/5th Battalion of the Royal Welsh Fusiliers. Son of the Rev. Owen Jones and Mrs. Jones of Fishwick, Kingsteignton. Died 26 March 1917 aged 43. A Barrister at Law. Educated at Newton Abbot College, and Trinity College, Oxford. Stoker 1st Class Frederick John Charles Jordan of the Royal Navy, HMS Warrior. Son of William and Margaret Jordan of Higher Sandygate, Kingsteignton. Born in Kingsteignton in the June Quarter of 1894. Died 31 May 1916 at the Battle of Jutland aged 23. Private George Frederick Knapman of the 2nd Battalion, the Devonshire Regiment. Son of William and Mary Ann Knapman. Born in Ashburton in 1883. Died 18 December 1914 aged 32. Believed to have been a postman. Gunner Thomas Lang of the 63rd Brigade, the Royal Field Artillery. Son of Thomas and Martha Lang of Oak Dene, Gestridge Road, Kingsteignton. Born in the September Quarter of 1885. Died 24 October 1918 aged 33. Leading Seaman William Henry Lang of the Royal Navy, HMS Watchman. Son of Thomas and Martha Lang of Gestridge Road, Kingsteignton and brother of Thomas Lang (see above). Born in Kingsteignton 9 July 1884. Died 10 July 1919 aged 35. Lance Corporal Arthur Henry Lethbridge of the 1st Battalion, the Devonshire Regiment. Son of John and Emma Lethbridge of Kingsteignton. Born in Chudleigh in the December Quarter of 1890. Died 21 July 1916 aged 26. Private Frederick Ridge Mander of the 1st Ontario Regiment, the Canadian Infantry. Son of David Ridge and Maria Mander formerly of York Terrace, Kingsteignton; husband of Bessie Ellen Mander of Clayburn B.C, Canada. Born in Kingsteignton in the March Quarter of 1886. Died 12 August 1918 and buried in Boves West Communal Cemetery Extension. Private Alfred Mason of the 3rd/7th Battalion, the Worcestershire Regiment. Son of William and Selina Mason of 4 Woolaton Terrace, Kingsteignton. Born in Kingsteignton in the September Quarter of 1884. Died 28 November 1916 aged 32. Private Frederick Charles Miller of the 2nd Battalion, the Devonshire Regiment. Son of James and Selina Miller formerly of Sandygate, Kingsteignton. Born in Highweek in the December Quarter of 1894. Died 31 July 1917 aged 22.. Private John Mortimore of the 1st Battalion, the Coldstream Guards. Son of William and Ellen Mortimore. Born in Kingsteignton in the June Quarter of 1893. Died 22 December 1914 aged 21. Gunner Frederick Charles Murrin of the 92nd brigade, the Royal Field Artillery. Son of Charles and Rebecca Murrin of 8 Fore Street, Kingsteignton. Born in Kingsteignton in the December Quarter of 1896. Died 7 October 1916 aged 19. Private Frederick Charles Murrin of the 9th Battalion, the Devonshire Regiment. Son of Charles and Elizabeth Murrin of Myrtle Cottage, Kingsteignton. Born in Kingsteignton in the December Quarter of 1880. Died 6 May 1917 aged 36. Private Frederick Newland of the 15th Battalion, the London Regiment (The Prince of Wales' Own Civil Service Rifles). Son of the late George Newland (see below) and his wife Mary Ann who came to live at 4 Blindwell Terrace, Vicarage Hill, Kingsteignton. Born in Paignton in the September Quarter of of 1899. Died 2 September 1918 aged 19. Petty Officer Stoker George Newland of the Royal Navy, HMS Lion. Son of John and Martha Newland; husband of Mary Ann Newland (née Croker) of 4, Blindwell Terrace, Kingsteignton; father of Frederick William Newland ( see above). Born in Halwell, nr. Totnes 21 March 1877*. Died 31 May 1916 at the Battle of Jutland aged 39. Trooper John Newton of the 1st Regiment of Australian Horse. Son of John and Agnes Newton of Clapperland Lodge, Ugbrooke. Born in Kingsteignton in the June Quarter of 1892. Died 9 October 1915 aged 23. Private Lewis John Osborn(e) of the 2nd Battalion, the Devonshire Regiment. Son of James and Lettie Osborn of Gestridge Road, Kingsteignton; husband of Lilian Maud (née Peters). Born in Kingsteignton in the March Quarter of 1891. Died of influenza in France 22 November 1918 aged 27. Private Harold George Partridge of the 72nd Battalion, the Canadian Infantry. Son of Henry and Mary Ann Partridge of 3, Clifford Street, Kingsteignton. Born in the June Quarter of 1888. Died 1 March 1917 aged 28. He was a Canadian citizen. Chief Petty Officer (Pensioner) Thomas Pike of the Royal Navy, HMS Laurentic. Husband of Agatha Pike of 4 Yeoman Terrace, Kingsteignton. Born in the March Quarter of 1873. Died 25 January 1917 aged 43. Served in the South African War and held Long Service and Good Conduct Medals. Able Seaman Ernest John Charles Purchase of the Royal Navy, HMS Vanguard. Son of Ernest and Caroline Purchase of 7 Clifford Street, Kingsteignton. Born in Kingsteignton 13 June 1898 . Died 9 July 1917 aged 19. Private William Rolston of the 2nd Battalion, the Devonshire Regiment. Son of Samuel and Mary Ralston of 49, Barton Avenue, Keyham, Devonport; brother of Mary Jane Rolston and Samuel Rolston. Born in Kingsteignton in the June Quarter of 1876. Died 1 January 1915 aged 39. Second Lieutenant Frank Scott of the 5th Battalion, the King's (Liverpool) Regiment. Son of John ("Jack") and Mary Jane Scott of Canal House, Kingsteignton. Born in Kingsteignton in the September Quarter of 1897. Died 8 October 1918 aged 21. Private George Henry Selley of the 1st Battalion, the Devonshire Regiment. Son of George and Mary Selley of Chudleigh Road, Kingsteignton. Born in the June Quarter of 1898. Died 4 October 1917 aged 19. Private Richard Henry Spears of the 14th Battalion, the Worcestershire Regiment. Husband of Jessie Ann Spears (née Laskey) of Fore Street Kingsteignton. Born in Kingsteignton in the September Quarter of 1885. Died 29 October 1917 aged 32. Sapper Thomas Stevens of the 156th Field Company, the Royal Engineers. Son of William and Elizabeth Stevens of Berry Lane, Kingsteignton. He was born in Kingsteignton in the March Quarter of 1878 and was the twin brother of Lewis Stevens. Died 22 March 1918 aged 40. Leading Stoker Edwin James Tothill of the Royal Navy, HMS Resolution. Son of Edwin and Emma Tothill of 6 Golver's View Kingsteignton. Born in Kingsteignton in the December Quarter of 1896. Died 15 May 1920 aged 23. Brother of William Tothill (see below). Private William Henry Tothill of the 1st/4th Battalion, the Devonshire Regiment. Son of Edwin and Emma Tothill of 6 Golver's View Kingsteignton. Born in Kingsteignton in the June Quarter of 1898. Died 3 February 1917 aged 18. Brother of Edwin Tothill. (see above). Private William Henry Tozer of the Depot, the Somerset Light Infantry. Son of Elias and Thirza Tozer of 2 Pleasant View, Chudleigh Road, Kingsteignton. Born in Kingsteignton.in the June Quarter of 1882 Died in hospital in Southport 22 February 1919 aged 36. Buried in St. Michael's Churchyard, Kingsteignton. Lance Corporal George Henry Vallance of the 4th Battalion, the Devonshire Regiment. Son of Andrew and Amelia Vallance of New Park, Kingsteignton. Born in Kingsteignton in the September Quarter of 1883. Died 9 May 1917 aged 33. Corporal Reginald John Vogler of the 1st Battalion, the Somerset Light Infantry. Son of John and Bertha Vogler of Kingsteignton. Born in Kingsteignton in the September Quarter of 1898. Died 15 April 1918 aged 19. Rifleman Henry Bovey Walters of the 9th Battalion, the Rifle Brigade. Son of Adoniah and Elizabeth Walters of 27 York Terrace, Kingsteignton. Born in the June Quarter of 1890. Died 20 August 1917 aged 27. Shipwright 1st Class Henry John Rattenbury of the Royal Navy, HMS Indefatigable. Son of William and Mary Ann Way of Kingsteignton and husband of Mary Way of 14, Ridgeway Terrace, Chudleigh Road. Born in Kingsteignton 3 August 1877. Died 31 May 1916 at the Battle of Jutland aged 39. Private Frederick John Weeks of the 8th Battalion, the Devonshire Regiment. Son of Frederick and Grace Weeks of Fairlight, Kingsteignton. Born in the December Quarter of 1896. Died 2 October 1915 aged 19. Private Sidney H. Willcocks of the 619th Mechanical Transport Coy. of the Army Service Corps. Son of Frederick and Harriet Willcocks. Born in Newton Abbot in 1880. Died 10 November 1917 aged 37. Private Harold William Yea of the 7th Battalion, the Royal Inniskilling Fusiliers. Son of William and Martha Yea of East Ogwell, Newton Abbot and nephew of Mr. and Mrs. T. Cook of Haroldene, Gestridge Road, Kingsteignton. Born at Highweek in the March Quarter of 1892. Died 16 August 1917 aged 25. Leading Seaman John Henry Yeo of the Royal Navy, HMS Tiger. Son of Henry and Alice Yeo of Gappah, Chudleigh. Born in Gappah 23 February 1894. Died 31 May 1916 at the Battle of Jutland aged 21. Buried in a war grave in the churchyard of St. Michael but not included on the War Memorial is Private James Sanders of the Plymouth Division, the Royal Marines Light Infantry. Son of William and Emily Sanders of Kingsteignton. Born in the June Quarter of 1889 in Kingsteignton. Died on 1 April 1921 aged 31. 278260 Chief Stoker William Withycombe of the Royal Navy, HMS Bellerephon. Son of George and Mary Withycombe formerly of Honeywell Road, Kingsteignton. Born 1 January 1875. Died 3 December 1914 aged 39. 44378 Frank Hamlyn of "D" Coy 1st Battalion, the Royal Irish Rifles. Son of Henry and Harriet Hamlyn; husband of Ellen (née Knapman) of 3 Hayes Terrace, Chudleigh Road, Kingsteignton.. Born in Teignmouth in the September Quarter of 1885. Died 14 October 1918 aged 33. In addition, the Mid Devon Advertiser records the death of 20 year-old Wallace Ford of Kingsteignton in October 1917. Soldiers Died names him as 10002 Acting Corporal Wallace Samuel Ford of the 1st Battalion, the Devonshire Regiment. He was the son of Samuel and Anna Ford of Crediton. Born in Crediton in the September Quarter of 1896. Died 16 May 1917 aged 20. Enlisted in Newton Abbot and presumed to have been working in the Kingsteignton area at that time.